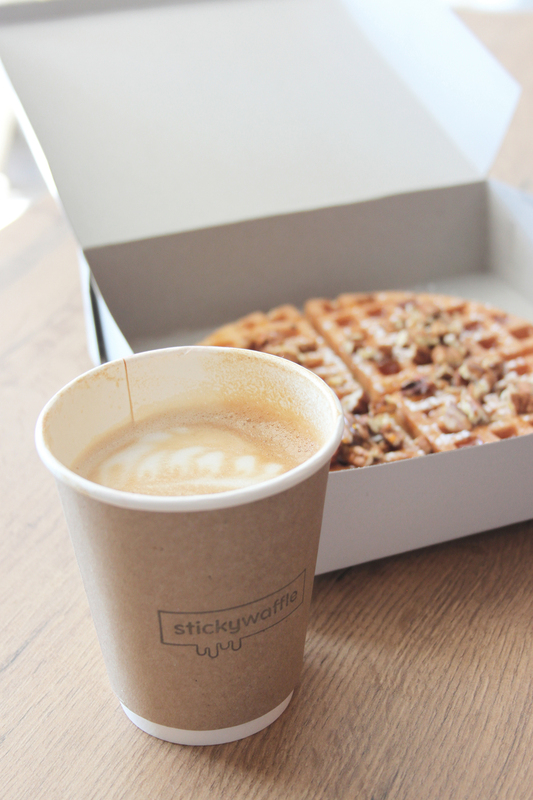 If you haven’t tried Sticky Waffle yet, you are missing out! 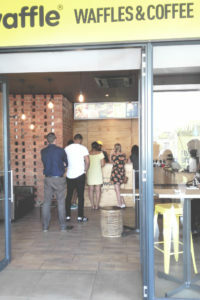 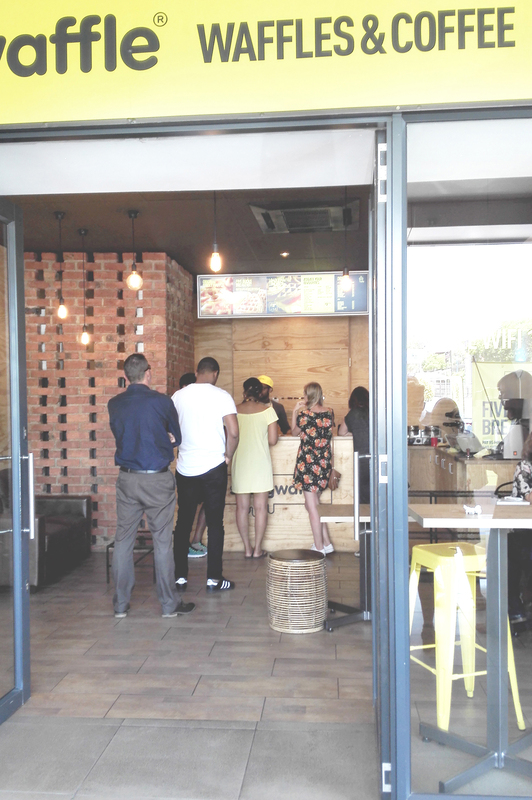 They opened on the 1st of September and are making some delicious waves in Bryanston, where they have made their debut. 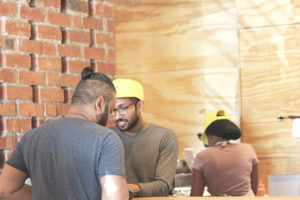 On Friday I popped by for lunch, and I enjoyed it so much that I came back the next day for their Five Bucks Breakfast special – yes, I said FIVE BUCKS! 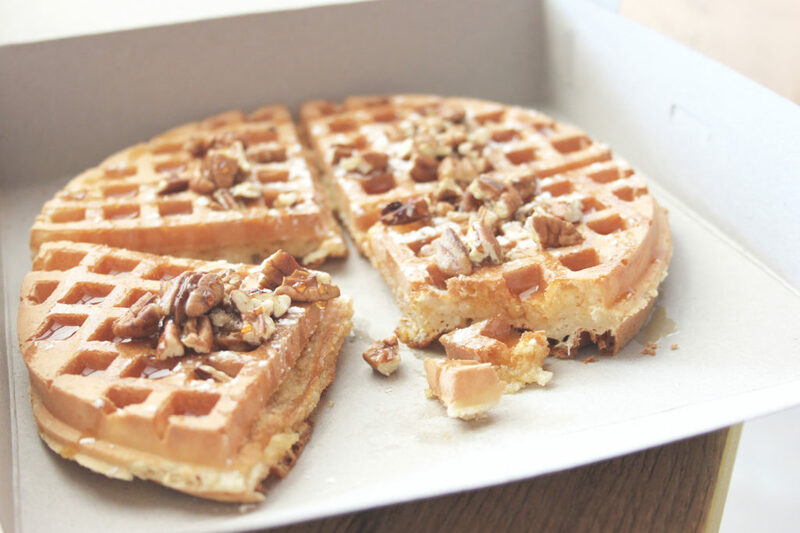 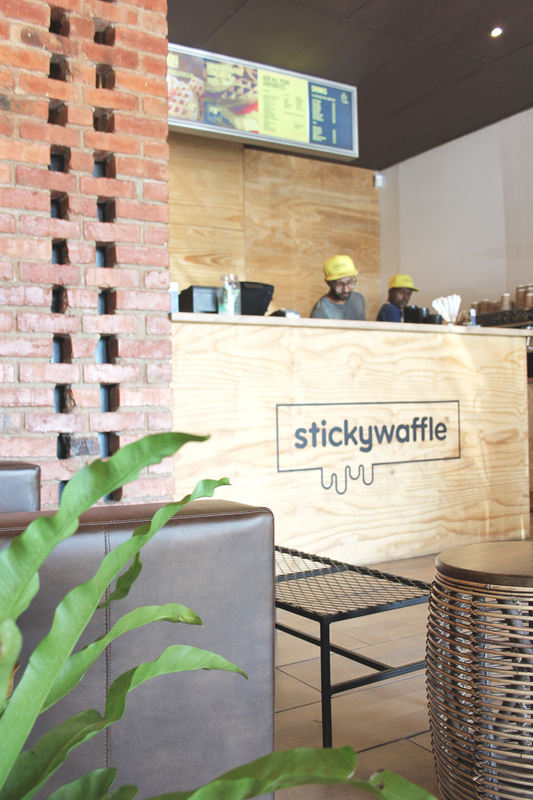 As I sipped my gourmet cappuccino by the window, with the smell of fresh waffles in the air, owner Dev Singh told me about what led him to opening Sticky Waffle. 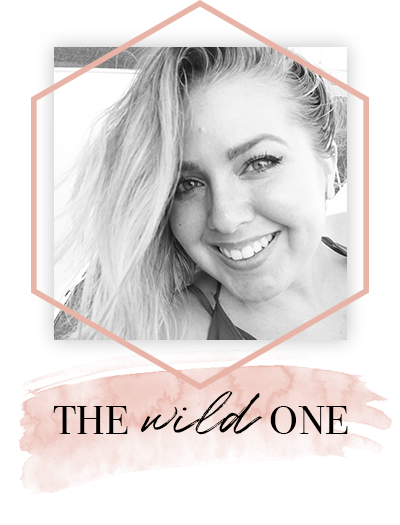 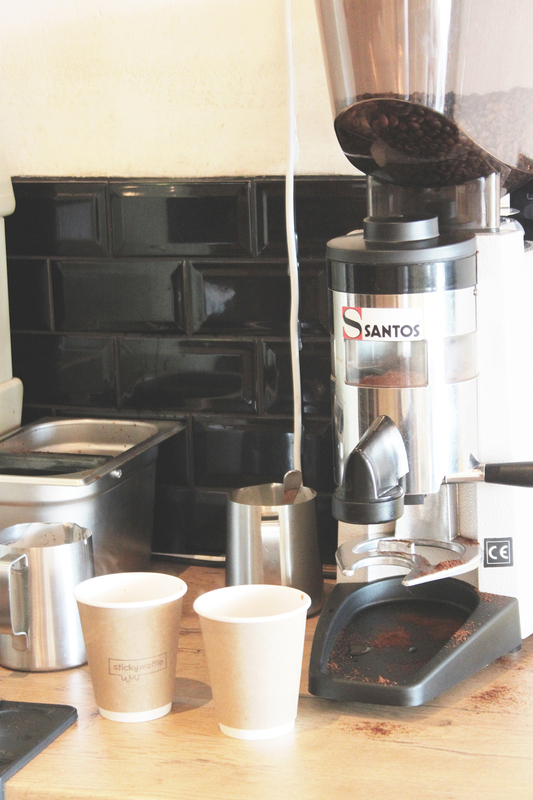 Dev manages everything about the business so far, and is completely self-funded. 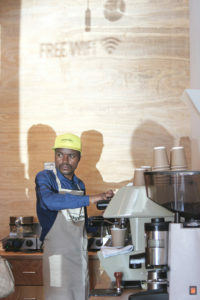 As a creative person with a background in Graphic Design; he has dabbled in different areas of work. These range from branding, to renovating antique furniture. 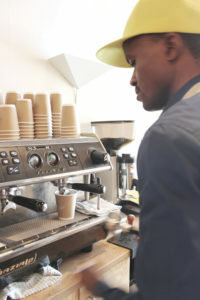 So it comes as no surprise that along with managing the store and waiting on patrons; he is also the brainchild behind it all. 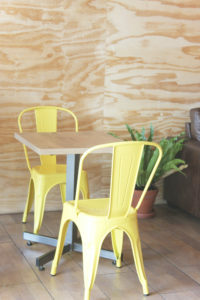 Including the trendy interior, the logo and the simple, fun and modern look. Dev told me that he had always wanted to start something of his own and once considered opening a coffee shop in the Rosebank firestation. This was because of his interest in gourmet coffee as well as the old feel of the firestation. But it’s clear why he chose the waffle and coffee combo. “I reeeally love waffles, I feel like there’s no really good waffle that’s under 50 bucks,” he says. 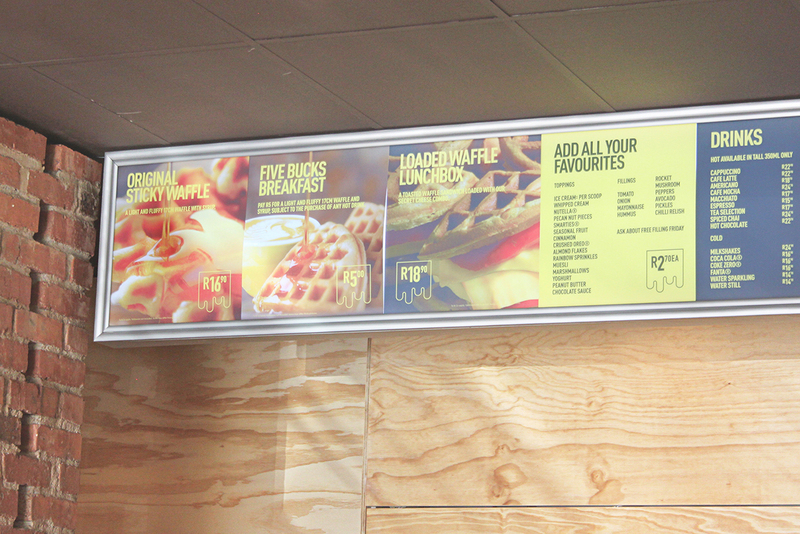 Believe me when I say this is it guys, this is the really good waffle under 50 bucks. My whole meal, coffee, plus tip on both days, came to less! 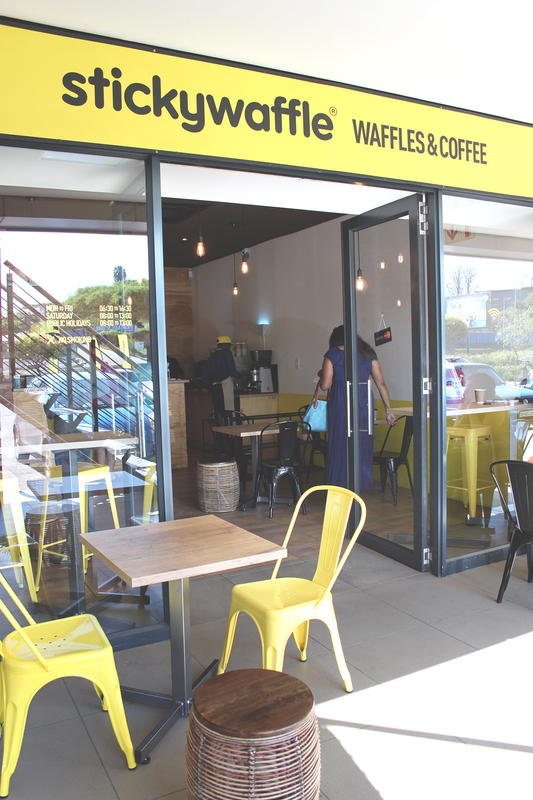 The meals are reasonably priced and the portion size is perfect. 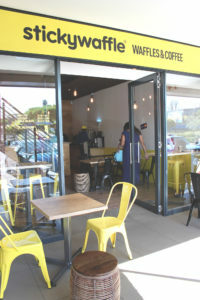 He adds that their current daily special is their promise of value for money. 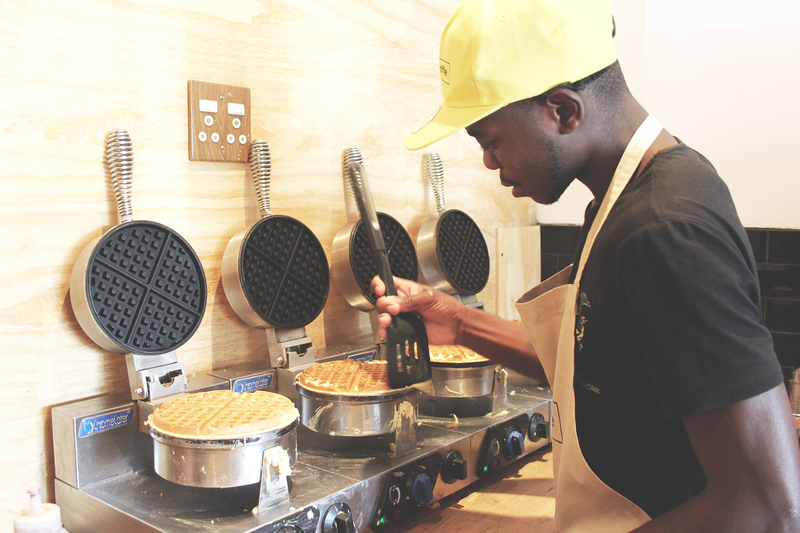 Ask for the Five Bucks Breakfast and pay ONLY R5 for a light and fluffy 17cm waffle with syrup. 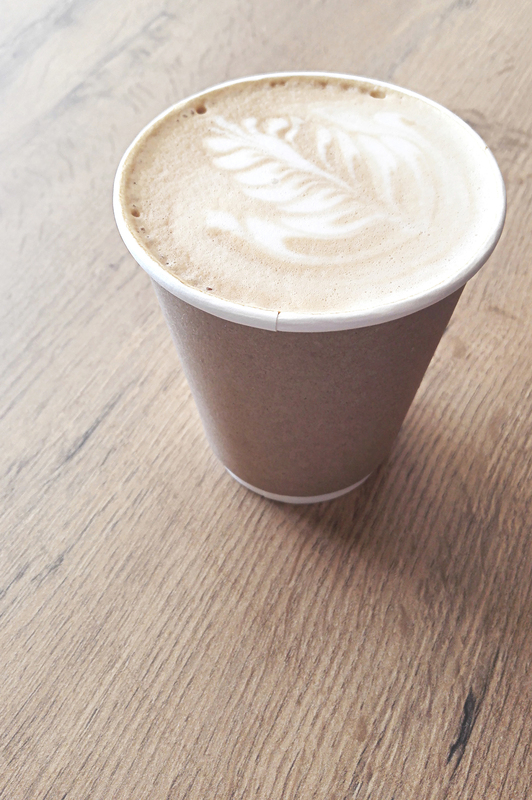 This special is subject to the purchase of any hot drink. 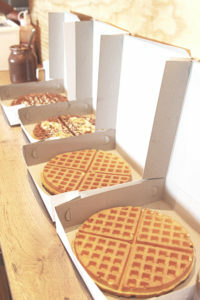 In the coming weeks they will be introducing new toppings and a new type of waffle. The Seriously Jacked Waffle will let you choose either choc chips or blueberries to get baked into the waffle base itself. They will also introduce a host of gourmet milkshakes like peanut butter and salted caramel popcorn. These will join their already popular espresso milkshake and standard selection. 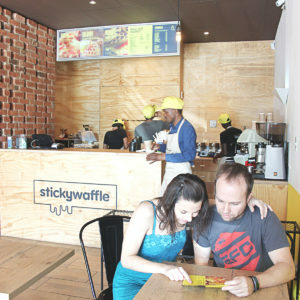 Some customers would love to see them expand with a stall at one of the Joburg’s markets, while others want to see them franchise; an intriguing prospect in Dev’s mind. 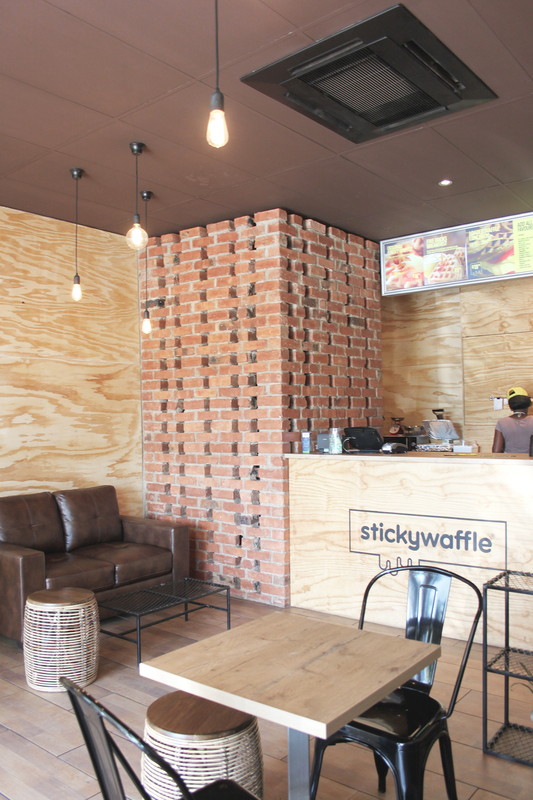 With friendly staff and a chilled atmosphere, Sticky Waffle is the perfect place to spend a Saturday morning with the family or grab a vibey weekday lunch. 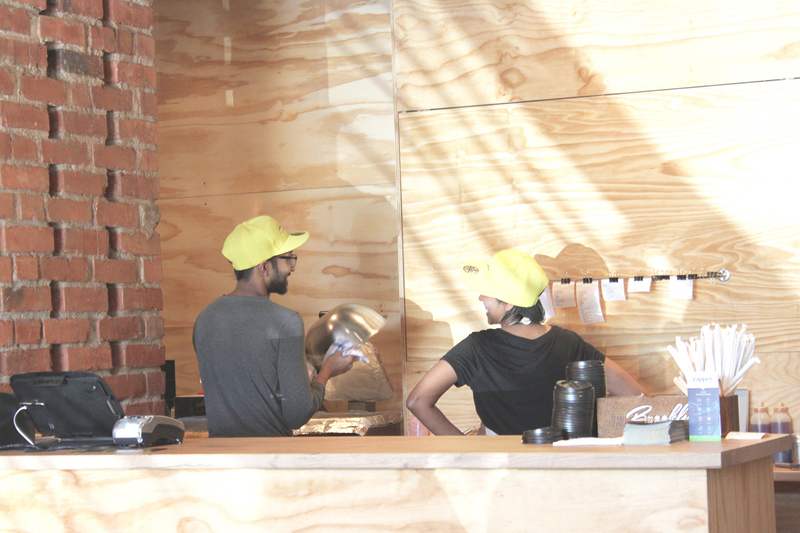 I’ll definitely be back to to see what’s next in store for them! 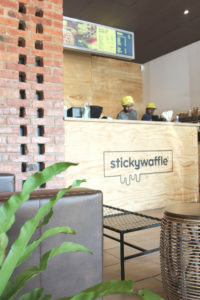 Follow their tasty feed on Facebook and Instagram (@stickywaffleza) and visit their website for more info. Follow me on Instagram for more delicious pics and watch out for a follow up post about their new offerings!